Our beautiful oceanview rooms are located on the second floor of Villa Corona del Mar and offer the best views of the beach. The Garden room has a king size bed and matrimonial bed with a private deck that looks out towards a salt water canal. Fantastic views of Jaltemba Bay, Isla Cangrejo and the beach are to be had with the Junior Suite. The Master Suite commands a breathtaking 360-degree view of the ocean, island, beautiful Rincon de Guayabitos and beach. Bungalows are best suited for long-term rentals or for those wishing to do their own cooking. 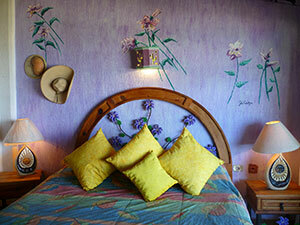 Situated near the tennis court and equipped with a small kitchen, king size bed, sofa sleeper and a private bathroom. Rates are subject to 16% Federal and 3% hotel tax.